Dominate the water, fresh or salt, with this superior fishing kayak. The Pro Angler 12 deploys all the big-boat fishing features of the ‘PA’ series on a 12-ft. long platform that fits neatly in the back of most any pickup truck. New for 2019, the Mirage Pro Angler 12 comes standard with the Hobie Guardian Retractable Transducer Shield. Brass inserts strategically placed fore and aft on the sides of the hull, ready to install an optional anchor trolley kit, for anchor, drift chute, or stakeout pole. Large-opening storage area offers easy access for storing fish or ice and can be removed for cleaning. Vantage Seating provides ultimate comfort and adjustability in a lightweight, easily removable form, along with Boa® system lumbar support technology. See the Pro Angler 12 in action as Morgan Promnitz reels in a Roosterfish (Pez Gallo) in Rancho Leonero. The all-new Hobie H-Rail system's extruded aluminum dodecagon rail provides a strong and corrosion resistant mounting platform to effortlessly mount more gear in more places. Adjustable seat-back with Boa® technology lumbar support. The adjustable seat bottom folds up and out of the way to make more deck space available for stand-up fishing. Derrières everywhere rejoice. The Vantage Seating system provides the comfort needed for long stretches out on the water. The seat-back, bottom, height, and lumbar-support are all easily adjustable. For extra visibility, the Vantage Seat can be adjusted into a position five inches higher than the standard position. 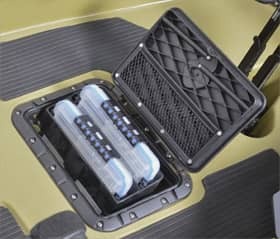 A rectangular hatch just in front of the seat conceals a mesh storage pocket and pivoting storage for two medium-sized Plano® tackle boxes (included). The storage area under the tackle boxes is also easily accessible. Primary and secondary steering handles allow the boat to be steered from either the port or starboard sides of the boat. Protect your rod tips. Hobie’s horizontal rod holders keep your rods out of the way. Deploy the tracking skeg when covering long distances in challenging conditions. Designed with the stand-up angler in mind, the H-Bar provides stability while standing and options for mounting extra gear.